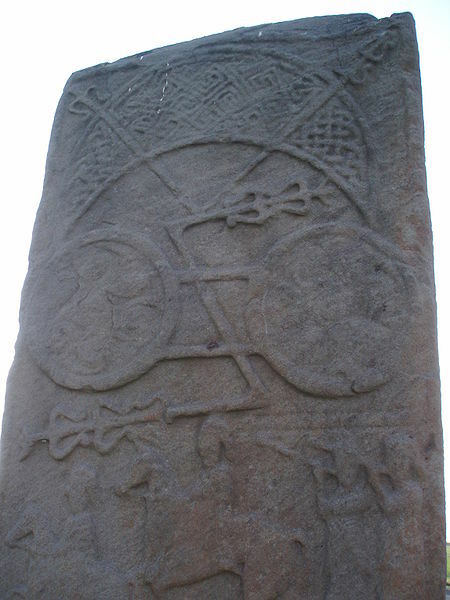 ← Pictish Symbols: Z-Rods and V-Rods – of Celestial / Astronomical Importance? Posted on April 10, 2013, in Pictish History and tagged Ancient astronomy, Ancient Celts, Ancient Picts, Archaeoastronomy, Archaeology, Astrology, Astronomy, Celtic, Celtic Religion, Druid, Druids, Ecliptic, History, Lleu, Lugh, Lunar astrology, mysteries, Pictish, pictish stones, Pictish symbol stones, pictish symbols, Picts, Retrograde, Scotland, Scottish, Scottish history, Solar, Vedic. Bookmark the permalink. 6 Comments. Definitely agree there’s a whole other level of complexity in meaning, as demonstrated by the decoration found on the rods. I’ve often thought about that when looking at the z-rod and double disc tatooed on my back ( traced from a photo of the Norrie’s law horde brooch pin). To me, the discs have always represented suns ( rising and setting? ), but also reincarnation, life and death, light and dark and life growing from death. The rod definitely looks like a spear, but also like a plant growing ( from the earth to the sky? a metaphor for life coming from the remains of the dead?) and the triskeles within the discs must surely represent the elements of the celtic world too? Loving the book by the way. Just got my copy last week! Hi Nancy, thanks very much for your kind comments! I think that the symbols are absolutely packed with meaning and hopefully one day we will have a better understanding of them! I believe that through the mythology one can understand the symbols, that in fact, the symbols come from drawing the mythology (mythological constructs) in a pseudo-scientific fashion. It is in this way, I feel you are on to something. The half-moon with Celtic knotting represents the whole of the visible heavens with the curve being the bend of the atmosphere from our vantage. The “knotting” inside it represents the geometrical “treasure” of the heavens itself; think Fafnir guarding the treasure in the cavern. The symbols that look like squares spiraling upon themselves are the ancient Greek symbol of water or fluid motion; or the “motion” of heavenly objects in the celestial ocean of the dark abyss. “The “V” is the two visible arms of the Milky Way as seen from our perspective, Sagittarius arm and Orion arm which define the two halves of the Zodiac.Rome occupied Britain and Roman, interpreted as “Greek,” concepts must have pervaded the Druid mind. Ask yourself, are any of these stones near or located in areas where Roman towns, encampments, villages or cities once were? If the “notched rectangle” is Orion then we have a depiction of the Zodiac in which case I say your connection to Lugh deals with the Sun traveling through the 12 symbols and his “spear” must mean the ecliptic. The twin circles must therefore be the Solstices as described by Cleomedes who in fact describes this very symbol accurately. Is it possible? In your mind, can you think it possible? That the way you see things today may in fact be the way they saw things yesterday? Is it possible that “we” as “modern knowledge” are in fact behind the times? Could it be? Could it be possible that all that we seek is right in front of our very eyes but we cannot see it because we are so self-centered that none of us will accept the truth as presented by the archaeology? Is the moon a horse simply because when you look at her; a horse’s head is made by the shadows upon her? Is that too simple a reason for ancient mysteries? Can you not see as I do?